In Illinois, This College Town Won't Be Eclipsed By August's Celestial Event A town of 26,000 will more than double in size as the Great American Eclipse takes place in August. From the local state university to longtime bakery, people are getting ready for it to get dark. 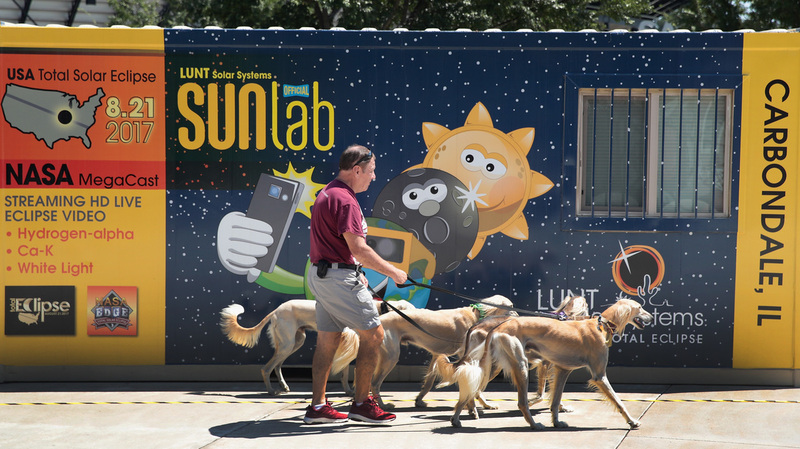 Jim Blair walks Saluki dogs past a solar eclipse exhibit on the campus of Southern Illinois University in Carbondale, Ill. With approximately 2 minutes 40 seconds of totality the area in Southern Illinois will experience the longest duration of totality during the eclipse on August 21. That small town is Carbondale. Located approximately two hours east of the Mississippi River, and founded around the railroad industry, it's home to musicians like Shawn Colvin, the first "Bucky Dome" house — and the only one that architect R. Buckminster Fuller ever lived in — and a university with a Saluki — an Egyptian running dog — as its mascot. Not everyone knows this much about Carbondale, but I grew up there, so I guess I'm a little biased. About two years ago, our friends who still live there started talking about an upcoming total solar eclipse and how everyone was bristling with excitement and planning how they could contribute to the celebration. I immediately knew that this would be a big deal for an otherwise small town. The last total solar eclipse to cross the contiguous United States was in 1979. While some people in Carbondale found out about the eclipse recently, there are others like Bob Baer who has had the event on his radar for years. Baer works in the physics department at Southern Illinois University and plans public astronomy events. He said he was approached about three years ago and asked to join a large eclipse research effort with Citizen Continental-America Telescopic Eclipse experiment, otherwise known as Citizen CATE. Part of the early research involved Baer going to Indonesia in 2016 with an SIU student to collect data on the sun's corona from a total solar eclipse. That was the first one he saw. Baer talked with me about his experience and said after he set up his equipment there, he was able to watch as the pure white halo formed around the sun's corona. As the sky got darker in the minutes leading up to totality, he said, things started to get weird. He called it "eerie, like just before a storm hits." As the color of the sky started to change, the nightlife woke up and got loud. Crickets started chirping, other bugs came out, and the birds and roosters acted as if they were going back to the roost. This might sound like a cacophonous mess — but then totality hits. "It was just beautiful," he said. "It was kind of a shock. Seeing it is the best way I can describe it, because I didn't know what to expect and you really can't miss it. You look up, and there's this beautiful corona that looks like no other astronomical object. It is literally like two to three times the size of the moon. It's so big." But that big moment only happens if you're in the path of totality, an approximately 60-mile wide band across the U.S. from Oregon down to South Carolina. If you're not in the path, you will still see a partial solar eclipse, but it won't be as dramatic. "In that path, they see totality, and that means they'll actually see the partial phases too — if they use those glasses — leading up to totality. When totality hits, you can take the glasses off and look at the corona directly and that's the unique part of it," Baer said. "Areas in the path of totality actually get dark and you get all those cool effects with animals and nature doing different things, and you get to see the corona. If you're just outside the path, even a few miles, you will not see totality, so that's why being in the path is really important." It's so important that NASA is also going to have a team in Carbondale, along with Citizen CATE, the Adler Planetarium in Chicago and the Louisiana Space Grant Consortium — which will have different activities and experiments happening leading up to and during the eclipse. In total, the town is expecting 50,000 people to come and experience totality for almost two minutes and 40 seconds — the longest duration throughout the entire path. One main viewing area is Saluki Stadium, where an all-day event will take place with a broadcast of live footage of the eclipse, the launch of high-altitude balloons and Planetary Radio's Mat Kaplan will host discussions and explaining what's happen as totality nears. Growing up, my family always went to university football and basketball games. The aluminum bleachers turned into a sea of maroon and the crowds cheered. For the eclipse, it will be just as packed, but no one is going to be looking at the field for entertainment, except maybe when the Marching Salukis, SIU's marching band, plays. Lou Mayo, a planetary scientist at NASA's Goddard Space Flight Center, will also be at the stadium the day of the eclipse. He's part of the team working with Baer and others at the university to make sure everything goes well. When I talked with him in his office, and complimented him on his solar system socks, his excitement filled the room. Mayo has seen a lot of celestial events, but a total solar eclipse isn't one of them. When he traveled to Paris to see one, cloudy skies obscured the view. He reiterated that preparation is key for those hoping to see totality this summer. Mayo said he's making sure all three of his daughters see the eclipse in Carbondale, and he booked the hotel rooms two and a half years ago. It's a good thing he did, too. All of the commercial lodging and hotels in the area are completely booked, says the executive director of Carbondale Tourism, Cinnamon Smith. A 17-story university residence hall also sold out. Karen Just and her son Mathew pitch a tent in a hay field which had been converted into a campground to host visitors for Monday's solar eclipse near Carbondale, Ill. All of the commercial lodging and hotels in the area are completely booked. There's no doubt that there will be a lot of people in Carbondale both staying there and viewing the eclipse. But less than 30 minutes away from Carbondale is Giant City State Park — that's where you'll find Fred Isberner on eclipse day. Isberner is with the Astronomical Association of Southern Illinois and will film the eclipse for Citizen CATE. The footage he captures will be part of a 90-minute film that shows the total eclipse as it happens across the country, recorded from 60 different locations along the path. This isn't the first total solar eclipse Isberner will see. He's traveled with his wife to see one in the Faroe Islands and other types of eclipses elsewhere. Despite all the traveling, Isberner isn't ready to call himself an eclipse chaser just yet. After this eclipse, he plans to travel to the South Pacific for another eclipse and then, he says he might consider himself an expert. And he wants to make sure others are able to experience events like this. In the years leading up to this eclipse, Isberner gave presentations to groups like Girl Scout troops, school clubs and locals who wanted to know more. He says he'll have extra glasses and a second telescope near his site. "We will have people there that can talk to the public and tell them about the eclipse and what's happening as they look at it through telescopes," he says. Back in Carbondale's downtown area, between a few businesses and restaurants, a huge crowd is expected. Open containers aren't normally allowed in Carbondale, but anything can happen with a solar eclipse. The city council approved an ordinance in January that allows people to have a drink as they participate in the celebrations within a four-block area. In that downtown area is where you'll find Cristaudo's and their famous pink cookies. Cristaudo's cookies are a Carbondale staple. They're so good that my sister in Arizona still compares every iced cookie to them. She says there is nothing that stands up. One of the best parts about going to Cristaudo's when I was young, was that each season had different frosted sugar cookies. There were marble-colored leaves in the fall, snowflakes and snowmen for winter and an array of flowers in the spring. So, of course they have some special eclipse cookies that are getting noticed on Facebook. Owner Nicholas Stewart says they will make more batches of cookies and stay open later to accommodate the crowds. "It's kind of like a big catering event," Stewart says. "It's hard to predict how many people are going to be here. [We're] Definitely going to be making a lot more cookies and pastries...we'll probably need no less than twice as much of what we normally make." 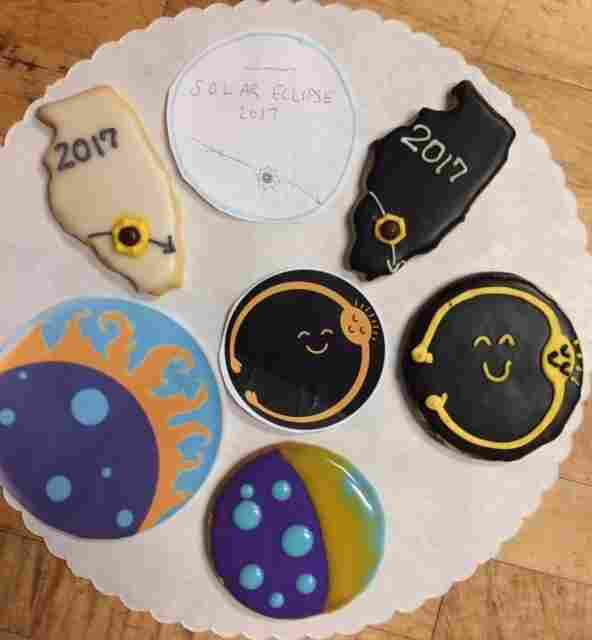 As for the eclipse-themed cookies, the bakery held a design contest and chose three to make. All three cookies will be available leading up the eclipse day and Stewart says they're trying out new designs everyday. While Cristaudo's will be open on on Monday, Stewart says all of the staff will take a break to look at the sky, too. If you haven't already guessed, I couldn't just talk to all of these people and just hear about how an entire town, my hometown, was changing for an event that will last just under three minutes. So, I booked my flight and I'm going home. Now if you feel like you're missing out, don't worry. Carbondale is also on the path for the 2024 total solar eclipse. Be patient and wait seven years, then make sure you're there for that celestial sighting. Wynne Davis was born in Carbondale, Ill., and spent 14 years in the town before moving to Houston, Texas.